Long-term investors should accumulate large-cap growth stocks on price weakness and sell small-cap value stocks on price strength, said Oppenheimer. Here are six stocks to consider buying now. Long-term investors should know by now not to be spooked by market selloffs, but that also means choosing stocks that have strong fundamental support for when the markets go back up. Oppenheimer slashed its lower-end target for the S&P this quarter to 1,740 from 1,900 as the index remains "vulnerable" over the coming weeks due to crude oil's breakdown and "coinciding resumption of weakness in the energy sector," according to a Jan. 18 technical note to clients. That said, the investment firm believes that the S&P's correction will bottom out in the first half of 2016. For now, investors should accumulate large-cap growth stocks on price weakness and sell small-cap value on price strength, said Oppenheimer. The six stocks the investment firm specifically recommends are all rated "outperform," are also in sectors it rates "outperform" and screen for positive earnings revisions, according to the note. "While the S&P is oversold in a broken trend, we believe we can improve our odds of success by busing stocks that, like the S&P, are oversold, and unlike the S&P, are in a bullish trend," the note said. "Faced with less resistance and benefited by greater support, we expect these stocks to hold up better in the coming months and lead the S&P higher in the second half of the year." Here's the list of Oppenheimer's stocks to buy on market weakness. We've paired the list with commentary from Jim Cramer, if the stock is owned by his Action Alerts PLUS Charitable Trust Portfolio, or ratings from TheStreet Ratings, TheStreet's proprietary ratings tool, for another perspective. TheStreet Ratings uses a quantitative approach to rating over 4,300 stocks to predict return potential for the next year. The model is both objective, using elements such as volatility of past operating revenues, financial strength, and company cash flows, and subjective, including expected equity market returns, future interest rates, implied industry outlook and forecasted company earnings. "Facebook, while cheap on a 2017 basis versus its growth rate, is certainly vulnerable to a short-term correction," said TheStreet's Jim Cramer, Portfolio Manager of the Action Alerts PLUS Charitable Trust Portfolio. Action Alerts PLUS owns shares of Facebook. "Understand, though, in the bearish environment we are in, bargains just become bigger bargains. We know that it's a solid company for the long-term, but there's no need to buy more when there are so many cheaper stocks on 2016 earnings," Cramer said. You see Jim Cramer on TV. Now, see where he invests his money and why Facebook is a core holding of his multi-million dollar portfolio. 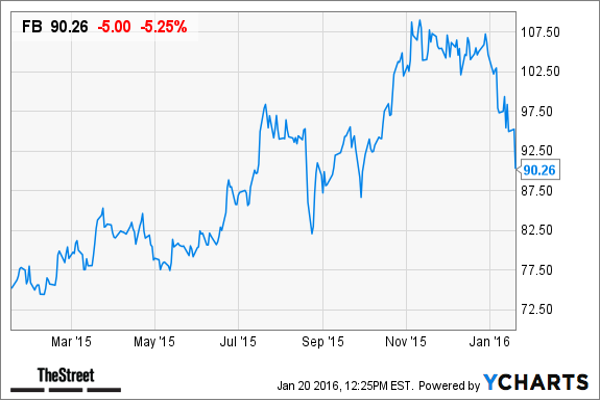 Want to be alerted before Jim Cramer buys or sells FB? Learn more now. 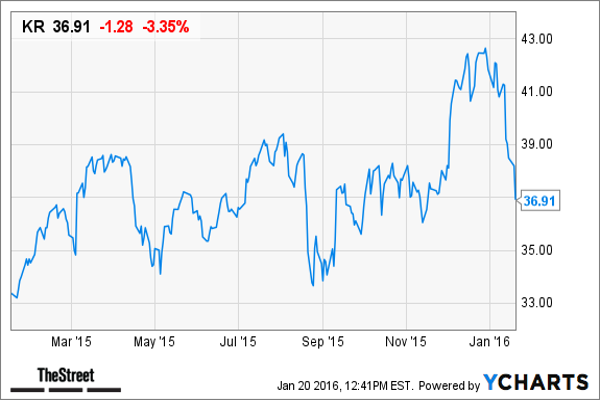 We rate FISERV INC as a Buy with a ratings score of A-. This is based on the convergence of positive investment measures, which should help this stock outperform the majority of stocks that we rate. The company's strengths can be seen in multiple areas, such as its revenue growth, expanding profit margins, notable return on equity, largely solid financial position with reasonable debt levels by most measures and solid stock price performance. We feel its strengths outweigh the fact that the company has had sub par growth in net income. The revenue growth greatly exceeded the industry average of 26.9%. Since the same quarter one year prior, revenues slightly increased by 4.0%. This growth in revenue does not appear to have trickled down to the company's bottom line, displayed by a decline in earnings per share. 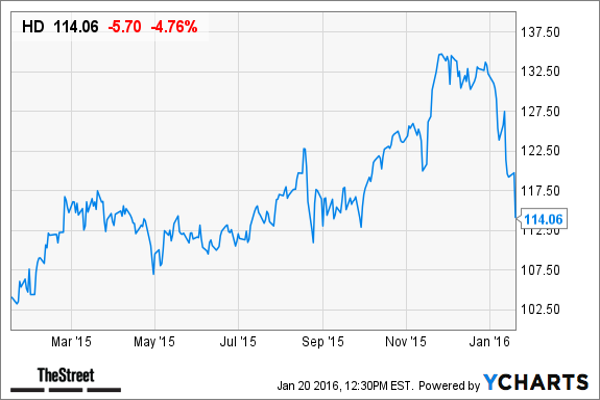 FISERV INC' earnings per share from the most recent quarter came in slightly below the year earlier quarter. This company has reported somewhat volatile earnings recently. But, we feel it is poised for EPS growth in the coming year. During the past fiscal year, FISERV INC increased its bottom line by earning $2.98 versus $2.45 in the prior year. This year, the market expects an improvement in earnings ($3.86 versus $2.98). The gross profit margin for FISERV INC is rather high; currently it is at 53.77%. It has increased from the same quarter the previous year. Regardless of the strong results of the gross profit margin, the net profit margin of 16.60% trails the industry average. The return on equity has improved slightly when compared to the same quarter one year prior. This can be construed as a modest strength in the organization. In comparison to other companies in the IT Services industry and the overall market on the basis of return on equity, FISERV INC has underperformed in comparison with the industry average, but has greatly exceeded that of the S&P 500. Even though the current debt-to-equity ratio is 1.48, it is still below the industry average, suggesting that this level of debt is acceptable within the IT Services industry. Regardless of the somewhat mixed results with the debt-to-equity ratio, the company's quick ratio of 0.77 is weak. We rate HOME DEPOT INC as a Buy with a ratings score of A+. This is based on the convergence of positive investment measures, which should help this stock outperform the majority of stocks that we rate. The company's strengths can be seen in multiple areas, such as its revenue growth, notable return on equity, good cash flow from operations, solid stock price performance and impressive record of earnings per share growth. We feel its strengths outweigh the fact that the company has had generally high debt management risk by most measures that we evaluated. HD's revenue growth has slightly outpaced the industry average of 4.5%. Since the same quarter one year prior, revenues slightly increased by 6.3%. Growth in the company's revenue appears to have helped boost the earnings per share. The stock has not only risen over the past year, it has done so at a faster pace than the S&P 500, reflecting the earnings growth and other positive factors similar to those we have cited here. Turning our attention to the future direction of the stock, it goes without saying that even the best stocks can fall in an overall down market. However, in any other environment, this stock still has good upside potential despite the fact that it has already risen in the past year. HOME DEPOT INC has improved earnings per share by 17.4% in the most recent quarter compared to the same quarter a year ago. The company has demonstrated a pattern of positive earnings per share growth over the past two years. We feel that this trend should continue. During the past fiscal year, HOME DEPOT INC increased its bottom line by earning $4.72 versus $3.75 in the prior year. This year, the market expects an improvement in earnings ($5.34 versus $4.72). The company, on the basis of net income growth from the same quarter one year ago, has significantly outperformed against the S&P 500 and exceeded that of the Specialty Retail industry average. The net income increased by 12.2% when compared to the same quarter one year prior, going from $1,537.00 million to $1,725.00 million. The company's current return on equity greatly increased when compared to its ROE from the same quarter one year prior. This is a signal of significant strength within the corporation. Compared to other companies in the Specialty Retail industry and the overall market, HOME DEPOT INC's return on equity significantly exceeds that of both the industry average and the S&P 500. 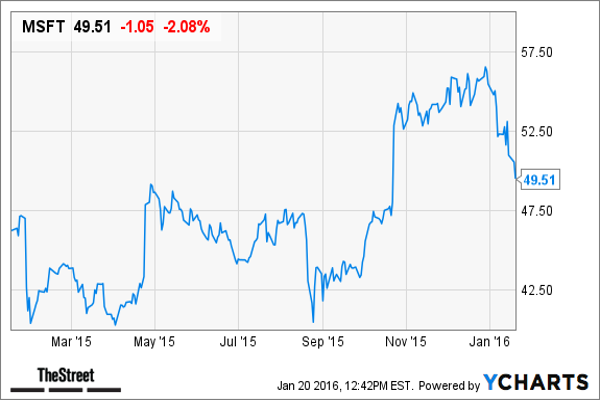 We rate KROGER CO as a Buy with a ratings score of A. This is based on the convergence of positive investment measures, which should help this stock outperform the majority of stocks that we rate. The company's strengths can be seen in multiple areas, such as its revenue growth, notable return on equity, good cash flow from operations, solid stock price performance and impressive record of earnings per share growth. We feel its strengths outweigh the fact that the company has had generally high debt management risk by most measures that we evaluated. The revenue growth came in higher than the industry average of 11.0%. Since the same quarter one year prior, revenues slightly increased by 0.3%. This growth in revenue appears to have trickled down to the company's bottom line, improving the earnings per share. KROGER CO has improved earnings per share by 17.8% in the most recent quarter compared to the same quarter a year ago. The company has demonstrated a pattern of positive earnings per share growth over the past two years. We feel that this trend should continue. During the past fiscal year, KROGER CO increased its bottom line by earning $1.73 versus $1.45 in the prior year. This year, the market expects an improvement in earnings ($2.04 versus $1.73). The net income growth from the same quarter one year ago has significantly exceeded that of the S&P 500 and the Food & Staples Retailing industry. The net income increased by 18.2% when compared to the same quarter one year prior, going from $362.00 million to $428.00 million. The return on equity has improved slightly when compared to the same quarter one year prior. This can be construed as a modest strength in the organization. Compared to other companies in the Food & Staples Retailing industry and the overall market, KROGER CO's return on equity significantly exceeds that of both the industry average and the S&P 500. We rate MICROSOFT CORP as a Buy with a ratings score of A. This is based on the convergence of positive investment measures, which should help this stock outperform the majority of stocks that we rate. The company's strengths can be seen in multiple areas, such as its solid stock price performance, increase in net income, reasonable valuation levels, expanding profit margins and good cash flow from operations. Although no company is perfect, currently we do not see any significant weaknesses which are likely to detract from the generally positive outlook. The net income growth from the same quarter one year ago has exceeded that of the S&P 500 and the Software industry average. The net income increased by 1.8% when compared to the same quarter one year prior, going from $4,540.00 million to $4,620.00 million. The gross profit margin for MICROSOFT CORP is currently very high, coming in at 71.80%. It has increased from the same quarter the previous year. Along with this, the net profit margin of 22.67% is above that of the industry average. Net operating cash flow has slightly increased to $8,594.00 million or 2.87% when compared to the same quarter last year. The firm also exceeded the industry average cash flow growth rate of -8.15%. "Starbucks reports this week and we know that nothing anyone says on a corporate level matters," said TheStreet's Jim Cramer, Portfolio Manager of the Action Alerts PLUS Charitable Trust Portfolio. "So we are keeping our powder dry to buy some lower because we are taking a long-term view." Action Alerts PLUS owns shares of Facebook. You see Jim Cramer on TV. Now, see where he invests his money and why Starbucks is a core holding of his multi-million dollar portfolio. 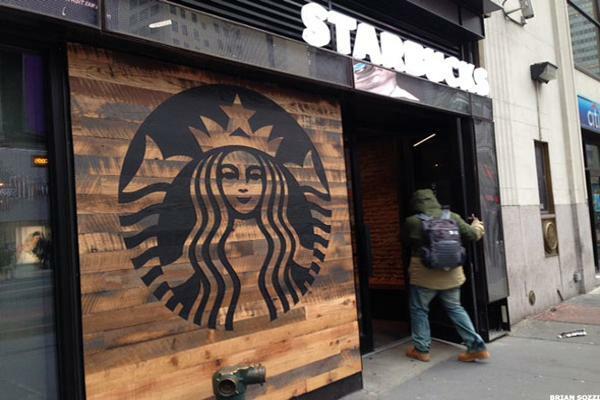 Want to be alerted before Jim Cramer buys or sells SBUX? Learn more now.